Fugaku and Mikoto do not come out. Kakashi and Gai are playing with each-other. The 3rd Hokage feels something. The 9tails summoned by the masked man goes to attack the village. Some Anbu report to the 3rd Hokage. The 3rd readies for combat. Minato is stone faced (I think like poker faced) as the 9tails violently rampages. Shikamaru’s dad and Chouji’s dad watch the fight. The masked man gets behind but Minato looks behind and punches him. The masked man manages to follow him. but again he gives no real answer. The masked man tries to tie Minato up with chains, but he escapes using hiraishin. 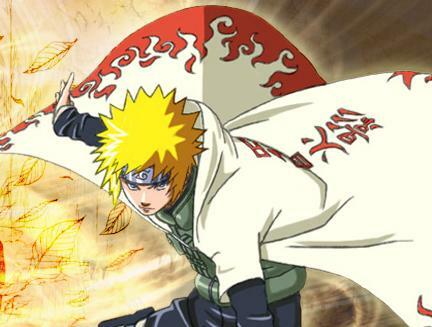 Minato appears and throws his special kunai at the masked man, but it slips through him. As it passes through the masked man, Minato attacks with a Rasengan from behind.